Medaille College seeks a full-time, non-tenured Assistant Professor of the Practice for the Department of Business, Management & Leadership at the Buffalo Campus. The successful candidate will teach Marketing in the traditional day undergraduate program, evening accelerated undergraduate and graduate programs, and online undergraduate and graduate programs, starting August 2019. Faculty members are expected to engage in continuing scholarly development and academic advising, as well as perform department and college-wide service. Position may require online course development. Experience with online/hybrid teaching a plus. Applicants are required to have a graduate degree in a business-related field, and substantial marketing industry experience. Prior teaching experience is preferred. Must have a strong commitment to teaching in a small college setting and to the education of diverse populations, a perceived ability to work productively with students, and the ability to work effectively with others in a collegial environment dedicated to student learning. Medaille College has received specialized accreditation for its business programs through the International Assembly for Collegiate Business Education (IACBE). Cover letter, resume and three references should be electronically submitted to Barbara Bilotta, Director of Human Resources, Medaille College. Review of applications will continue until position is filled. No phone calls please. Medaille College invites applications from all qualified individuals. We are committed to a diverse faculty, staff and student body and we support faculty development within a collegial team atmosphere. Please attach the documents specified in the job description above. 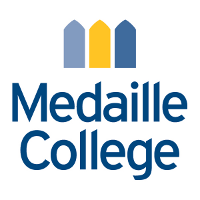 Medaille College is a dynamic, private, four-year college, located on an attractive campus in Buffalo, serving Western and Central New York and Southern Ontario. The College is known for its flexible delivery systems with enrollment of over 2500 students at campuses in Buffalo and Rochester.